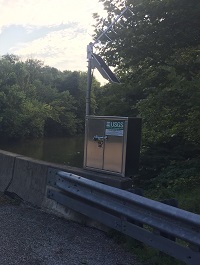 LOCATION.--Lat 41`25' 05", long 77`02' 00", Lycoming County, Hydrologic Unit 02050206, on upstream left corner of bridge on Township Route 840, 0.5 mi downstream from Grays Run, and 2.6 mi northeast of Trout Run. PERIOD OF RECORD.--December 1913 to current year. GAGE.--Water-stage recorder and crest-stage gage. Datum of gage is 693.95 ft above National Geodetic Vertical Datum of 1929. Prior to June 1, 1939, non-recording gage near current site at same datum. Prior to July 20, 2018, gage located at site 150 ft upstream on right bank at same datum. Satellite telemetry at station.